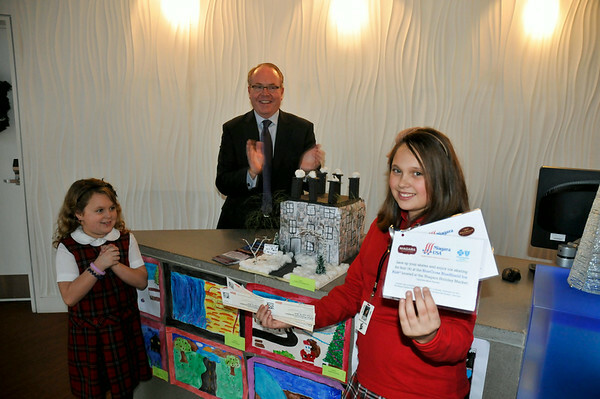 James Neiss/staff photographerNiagara Falls, NY - Lexi Storey, 7, beams with pride as she and John Percy, President and CEO of the Niagara Tourism & Convention Corporation, applaud St. Dominic Savio Middle School first-grader Skylar Storey, 12, for earning 1st place in the Holiday Art Contest, sponsored by the NTCC in partnership with the Niagara Holiday Market, the Giacomo Hotel, the Sheraton at the Falls and the Aquarium of Niagara. Storey built a model featuring a winter scene of the French Castle at Old Fort Niagara. Some of the prizes she won include tickets to the Buffalo Philharmonic Orchestra, passes to the Aquarium of Niagara and a stay at The Giacomo hotel.